Too Lenient  We want to be merciful and forgiving, but if we do not recognize how deadly and dangerous sin truly is, then it will destroy not only the sinner, but the body of believers too. It is like a virus or cancer. 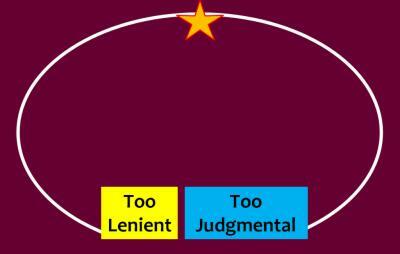 Being too lenient avoids the opportunity for growth and positive change. Too Judgmental  On the other hand, taking a tough stance against sin can cause us to lose mercy and we easily become too judgmental. We forget why must deal with sin: Instead, we confront sin because we just think we are supposed to and not to help others. We are fearful rather than hopeful. We are angry rather than humble. Remember that when we confront sin, we are also confronting sinners  real people with real problems. People that God loves. We are sinners helping other sinners. Its not a good choice. It is a false difference because these extremes are not that different. They each tolerate a different set of sins. On the side of judgment, the sins of arrogance, self-righteousness, dissension, gossip, hatred, prejudice are tolerated. Both ends are rooted in earthly, non-spiritual ways of looking at the world. What we strive for is a higher, spiritual way of dealing with sin and with one another. That way of doing things would affirm the worth of others and the importance of community without avoiding the real problems of sinfulness and the danger that it can pose to ourselves, others, and the community. What does such a way look like? In the middle of a sermon about life in the kingdom of heaven, Jesus describes a simple process that guides believers in managing and overcoming the sin that disrupts our lives and our life together. We have been seeking clear statements from God about what we are supposed to do. If we would truly follow this simple teaching, then the church of God could overcome so many problems. We would win credibility among outsiders who notice how we handle sin and disputes. The process is simple and has four steps. These steps have to be followed in order. Each step, if successful, is the last step  for the goal in every case is repentance and reconciliation. Step 1  A Private Conversation. Has a brother or sister sinned against you? Go and talk to them. Have you sinned against someone? Go and talk to them. [Hey, wait it says they have to come to me. Thats a misreading of the Bible. The intent is the same. If you KNOW you have offended someone then do something about it!] Do not run about gossiping to others or wounding the character of the other. Do you seek harm or good? Whats your goal? If you and the other person can come to an agreement and reconcile, then leave it with God. Christ is with you in this. If you agree, he agrees with you. The matter is settled. Sin has lost its power and youve tasted just a little of the kingdom of heaven. Step 2  A Few Wise Witnesses. Sometimes it is easy to achieve reconciliation. People do not always agree. But lets not jump to step 4 like we usually do. We dont need to begin writing letters and making denunciations at this point. No, we can seek help from those who are interesting in the same goals: agreement, reconciliation, peace, forgiveness, and overcoming sin. Who are these wise witnesses? They could be anyone. They are trusted people. Ideally, people who are respected by both parties. They can defend the interests of both parties and the community of believers. They recognize that the accused may be stubborn and reluctant to admit guilt. They also recognize that the accuser can be too harsh. These wise witnesses remain as partners in accountability. So, that when agreement is reached they are also part of the agreement and when the temptation to re-open the case comes along, the witnesses remind the parties that the matter is bound/or loosed  and that is also heavens ruling because Christ agreed with us too. Step 3  Inform the Church. Of course some problems can become quite large and complicated. This is when the church needs to be told. On one level, the church (the community of believers) needs to reach out to the sinner and work toward reconciliation. This is a work of love. All the members of the church are responding in prayer and outreach to affect the return of the lost brother or sister. On another level, this is the churchs defense against gossip and division. The wise witnesses have been involved at this point, so their testimony is a respected guide to the community. Still, the goal is to win back the one who has sinned. Step 4  Treat Like an Outsider. This is the only possible outcome is all else has failed. This is not excommunication. It is not church discipline in the sense of a public execution of ones character. It isnt marking out the heretic. The correct term is shunning. The community of believers has to treat the stubborn sinner as an outsider because the person is not interested in agreeing with Christ. This is much less informal than institutional options. Families sometimes have to do this when a member of the family is so dedicated to destruction because of addictions or violence that the family has to cut ties or they will suffer the same destruction. A church family may have to do the same. Even when the church shuns the person, the hope is that he or she will repent. 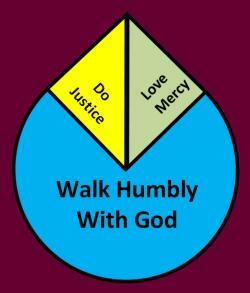 If we would follow this teaching, step by step, think about how healthy our churches could be. Think about how we could avoid so many problems and gain credibility among outsiders who are looking for a better way to build community. So why dont we? Because we are not interested in or dont understand what Christ said when he said, "Again, I tell you that if two of you on earth agree about anything you ask for, it will be done for you by my Father in heaven. For where two or three come together in my name, there am I with them." When we want to win. When we want to be validated. But how has God treated us? I think that the teaching ends with a parable that reminds us how we live in Gods mercy so that we will both be just and show mercy. The realization of Gods grace keeps us humble. Lets take Christ at his word and start working out differences and helping each other overcome sin. God could be in our midst in every way if we will take this seriously.